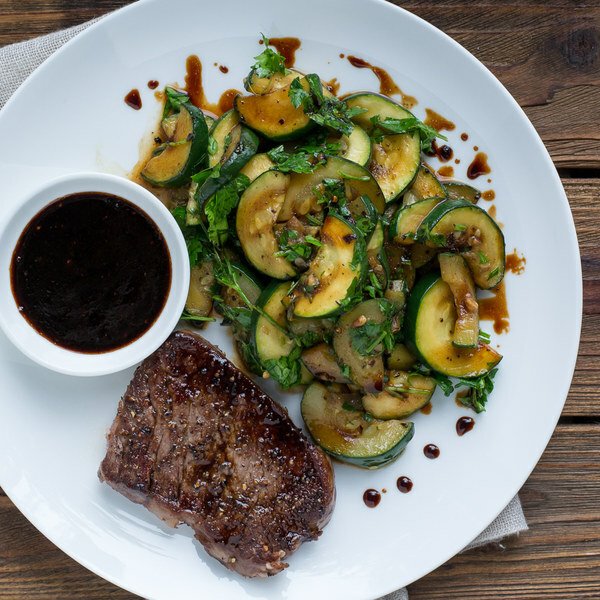 ← Steak with Balsamic Reduction & Garlic Zucchini Sauté. Peel and mince garlic. Wash and dry zucchini and parsley. Trim zucchini ends; halve lengthwise and slice into half rounds. Shave parsley leaves off the stems; discard the stems and mince the leaves. Add zucchini, salt, and pepper. Stirring frequently, cook until tender and lightly browned, 5-6 minutes. Transfer to a bowl and stir in parsley. Return skillet to stove and add more oil. Season steak with salt and pepper and place in skillet. Cook until desired doneness, 2-5 minutes per side. Transfer to a plate and loosely cover with foil. Discard any fat from skillet, return to stove, and reduce heat to medium-low. Add vinegar, salt, and pepper. Cook until reduced by about ½, 2-3 minutes. Thinly slice steak against the grain. Add any accumulated juices to skillet and stir to combine. To serve, place steak and zucchini on a plate and drizzle with balsamic reduction. Enjoy!